With the release of CorelDRAW Graphics Suite X7, comes a brand new FREE app from Corel for the iPhone and iPod Touch called Patterns. I am a graphic designer, and this new app has been fascinating to work with. It is an app that simplifies the complexity of seamless patterns at the touch of a few gestures. In this era of touch devices, the Patterns app integrates seamlessly with the Corel Content Exchange, and it is as easy as it could be to use in a daily workflow. Let’s go through the app in detail, from installation to interface, usability and integration with CorelDRAW Graphics Suite X7. Launch the App Store on your device, and go to Search page. 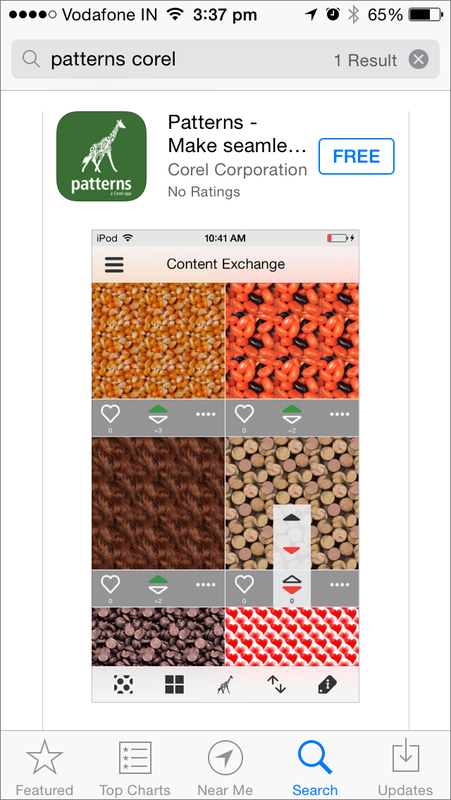 Search for “Patterns Corel” without quotes, and the app will show up in the search results. Tap on the FREE button and tap Install. The 8.5 MB app gets installed in about a minute on a normal broadband connection. Download and install the app in iTunes on your computer. Then, sync your device with iTunes to transfer the app onto your device. After installing and launching the app, you are presented with a Welcome Screen. Swipe right-to-left to navigate through intro screens. On the last screen, you will be asked to sign into your Corel account, or to create a new account if you don’t have one. Enter your login credentials, and you’re ready to use the app. Once you are signed into your Corel account, you will see Patterns being loaded from the Corel Content Exchange. The home screen displays patterns in a tiled interface. Each pattern has sub-options, which I will cover later in this post. Toggles the view of patterns between the seamless tile view and the original photo that was used to create the pattern. Toggles between grid and list views. In the grid view, two patterns are displayed side by side, whereas in the list mode, the patterns are displayed one below the other. Gives you the option to either start capturing a pattern by using your built-in camera or loading a photo from your existing library. Shows options to sort patterns by one of the following: Hot, Top, Popular or Recent. Lets you show/hide pattern information. You start by either capturing a photo with your built-in camera or simply loading a photo from Camera Roll by tapping the center (Giraffe) button. Click or load the picture from which you want to create a pattern. 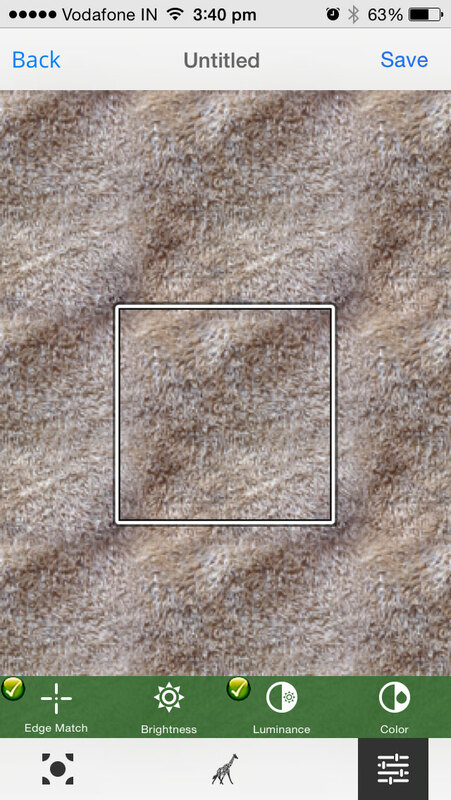 Once you click and confirm to use a photo, you can then pinch and rotate to adjust the look of your pattern. Once you are happy with your pattern, you have some options to fine-tune the pattern; for example, you can use Radial/Linear Blend to minimize the edges for a seamless look, or you can use tonal features like Brightness, Luminance, Color and Edge Match. Next, tap on Save (top-right corner) to proceed to the final step. You need to enter a title for your pattern, apply a tag related to the pattern, and choose a relevant category. You also have the option to share your pattern on the Corel Content Exchange so that others can see or use your pattern. Click Done to finish. Now that we have created a pattern, let us go through some of the options that are available to play with. As a user, when you tap on a pattern that has been created or shared by another user, you have the option to add a pattern to Favorites, to Vote Up or Down for a pattern, to add or save a pattern to your device library, to flag a pattern as Offensive/Broken File/Wrong Category/Copyright Infringement or to hide a pattern. As a creator, when you tap on a pattern that has been created and shared by you, you will see slightly different options, such as: Adding a pattern to Favorites, Voting Up/Down a pattern, editing a pattern, stop sharing a pattern on the Corel Content Exchange, deleting a pattern, saving a pattern in your device library, sending a pattern via email or posting a pattern on Facebook from within the app itself. At the top left corner of the home screen is the menu button. Tapping this button will let you navigate through the categories on the Corel Content Exchange, access a specific category and jump to patterns for which you have voted or which you have added to Favorites. 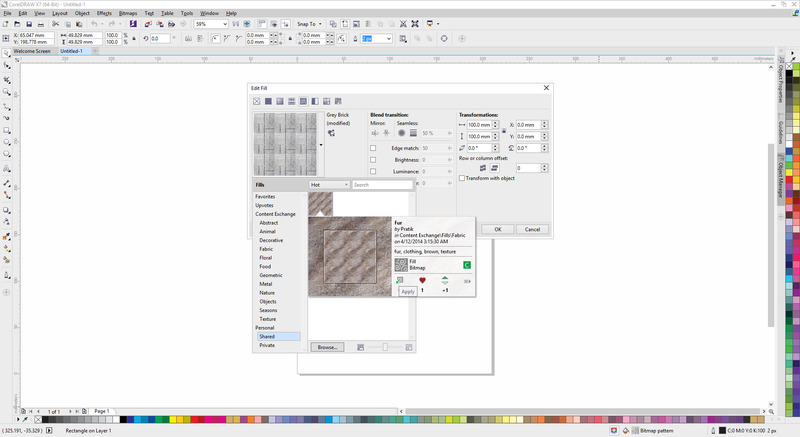 Patterns integrates with CorelDRAW Graphics Suite X7 seamlessly. The moment you share a pattern on the Corel Content Exchange from your device, it is available for use in CorelDRAW or PHOTO-PAINT under bitmap patterns. Love it! Big thanks to team Corel for this truly marvellous app and even bigger thanks for giving me an opportunity to write my first blog post ever! Pratik is a graphic designer, and CorelDRAW Master, living in Mumbai, India. He started his own design company and works in web design, catalog and book design for publishing companies. With a strong interest in arts and drawing, he enjoys expressing his ideas in a creative form. This entry was posted in Graphic design, Technology and tagged apps, Corel, CorelDRAW, CorelDRAW Graphics Suite X7, mobile, mobile apps, Patterns. Bookmark the permalink. Sorry for being off-topic, but I have wasted over an hour and a half searching the Corel site for a contact point where I can submit bug reports/feature requests, indeed for any electronic method of contacting Corel for any purpose. . Might you supply that information? The product manager email address I had now bounces. So far I`ve never tried Corel Content Exchange but this app seems promising! I`ll try it out thanks! This needs to be made available for Android/Windows phones too. Not everyone in the whole wide world uses an iPhone. We are looking at other platforms to host Patterns on, including Android. When we have news to share on an Android version, we will share it on our blog. Stay tuned. This app should have a Win Pho version. CorelDRAW doesn’t even runs natively on Macintoshes.